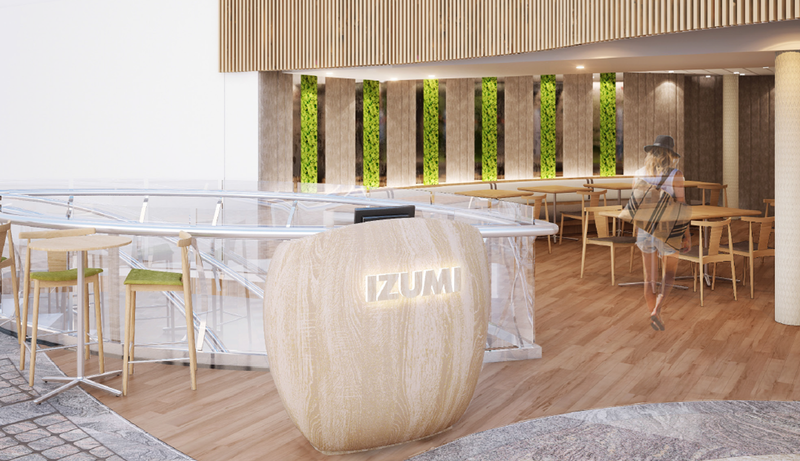 As the designers for the newest Izumi restaurant on RCCL we were intrigued with how simultaneously Japanese culture is wildly modern yet still intensely traditional. Traditions are tightly woven into modern Japan and this notion captivated us. Izumi, a name given to Japanese girls, means “spring” and we interpreted our Izumi like spring itself, a fresh and clean start to a new season, a minimalist modern woman that exudes both a jovial and authentic attitude. The clean lines of the linear wood slats playfully fill the space with meaningful rhythm while our young Izumi’s face on the oversized artwork wall provide us with a hide and reveal of her layered personality. The equivalent of body art, her tattoos subtly refer to ancient Japanese paintings with delicate birds and blooming branches. The raw rituals of preparing sushi is visually experienced by guests with an open and inviting kitchen. Spring is introduced into the space with tactile moss inserted within the walls of the dinig area. 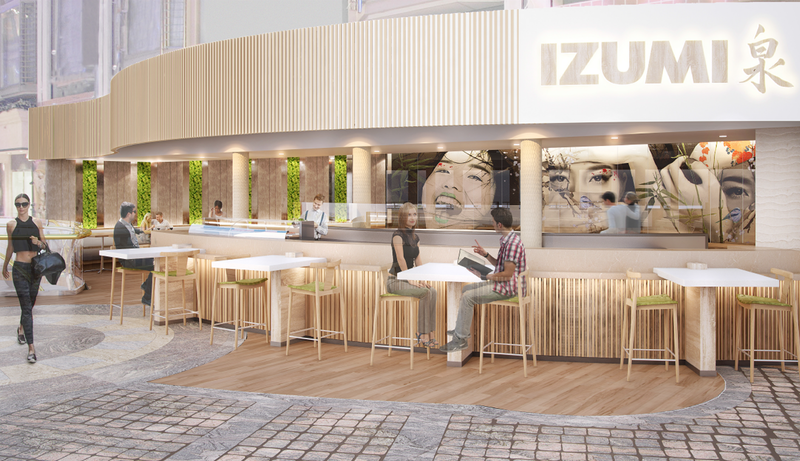 Izumi calmly stands by as our icon of spring with her modern interpretation of the centuries old tradition of sharing sushi with friends.